Haha! She was awesome, I would totally give her some banana bread! CONGRATS!!! Well deserved!!!! Doing the “Happy Dance” with ya! Wooo Hoooo!!! Congratulations V…..I am so excited for you. I am so proud of my foodie daughter..Enjoy the victory and dance your heart out!! I know the feeling! Love your foodie momma!!!! I participated in fairs for many, many years, so I know exactly how you feel. This is wonderful. Lillian, did you ever do a happy dance and start squealing? It’s hard for me to imagine you being as ridiculous as I was when I found out. Haha!! It’s quite a thrill, isn’t it? Yeah, only took 6 years! haha! MAKE SURE YOU’RE NAKED ON THE ROOFTOP WHEN YOU DO THAT!!!! LOL!!! WAY TO GO GIRL! NOW YOU NEED TO FRAME IT AND HANG IT ON THE WALL!!! Happy for you. You have worked hard for this moment enjoy!!! Wow!!!! 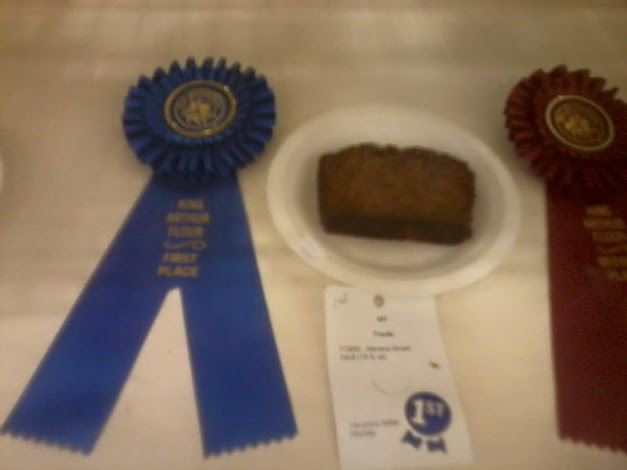 Congrats on winning a blue ribbon. Isn’t God awesome? Yes you have a right to scream it to the world. You deserve it. Very happy and excited for you. Congratulations!!! I’ve made your other banana bread recipes and loved them so this one must have been KERAZZZY GOOD!!! The texture really sets it apart. It’s so soft & tender, unlike any banana bread I’ve ever eaten. It’s also sweeter than most banana breads, which is A-OK in my book! CONGRATULATIONS! You can do anything when you believe in yourself! I’m so happy for you! Congratulationsr! I’m so excited for you! Please visit my Pinterest board titled, ‘Bananas for Banana Bread’, found here https://www.pinterest.com/dorana1/bananas-for-banana-bread/ Over 1,000 banana bread recipes just waiting to be tested, tweaked and tasted, for your next possible, fair winning recipe! I look forward to the post including your recipe for your winning banana bread! Congratulations!! I make banana muffins on a regular basis so I will look forward to seeing your recipe! I have a couple of recipes and one is a family recipe passed down. I love family recipes that have been passed down! I hope you like this one, it’s simple but has an ingredient I’ve never ever seen in banana bread before. Whoop! Whoop! You rocked it, girl! Awwww, that’s awesome, thanks Sophie! !